One week after the Solemn Feast of Mary’s Assumption into heaven, the church celebrates today the Mother of God as Queen of Heaven. In the fourth century St. Ephrem called Mary “Lady” and “Queen.” Later Church fathers and doctors continued to use the title. Hymns of the 11th to 13th centuries address Mary as queen: “Hail, Holy Queen,” “Hail, Queen of Heaven,” “Queen of Heaven.” The Dominican rosary and the Franciscan crown as well as numerous invocations in Mary’s litany celebrate her queenship. It was Pope Pius XII who established this feast in 1954. But Mary’s queenship has roots in Scripture. At the Annunciation, Gabriel announced that Mary’s Son would receive the throne of David and rule forever. At the Visitation, Elizabeth calls Mary “mother of my Lord.” As in all the mysteries of Mary’s life, Mary is closely associated with Jesus: Her queenship is a share in Jesus’ kingship. We can also recall that in the Old Testament the mother of the king has great influence in court. In his 1954 encyclical To the Queen of Heaven, Pope Pius XII points out that Mary deserves the title because she is Mother of God, because she is closely associated as the New Eve with Jesus’ redemptive work, because of her preeminent perfection and because of her intercessory power. Taken up into heaven, Mary shows us the way to God, the way to heaven, the way to life. She shows it to her children baptized in Christ and to all people of good will. She opens this way especially to the little ones and to the poor, those who are dear to divine mercy. 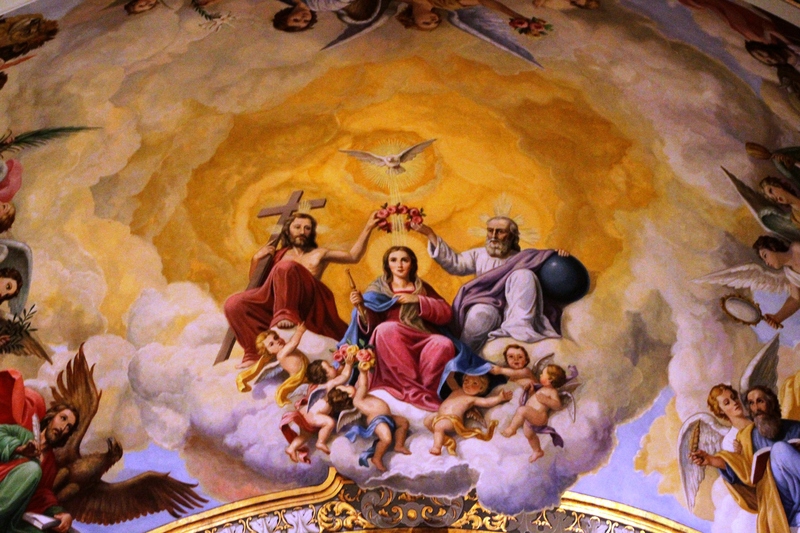 The Queen of the world reveals to individuals and to nations the power of the love of God whose plan upsets that of the proud, pulls down the mighty from their thrones and exalts the humble, fills the hungry with good things and sends the rich empty away (cf. Lk 1:51-53). Mary’s earthly life is a journey of faith, hope and love, an exemplary way of holiness which began with the enthusiasm of her “fiat”, the exultation of the “Magnificat”, contemplative reflection in everyday life, perseverance in the dark night of the Passion until she could share in the joy of her divine Son in the radiant dawn of the Resurrection. She is an outstanding model for each of us, and her Assumption into heaven reminds us that there is hope for you and me… what happens to the Virgin daughter of Nazareth at the end of her earthly pilgrimage will happen to each of us if we are faithful and obedient as she was. We believe that because of the obedience and fidelity of the Blessed Virgin Mary, at the end of her earthly life, she was assumed both body and soul into heavenly glory. The glory of the Mother of the Savior is a cause of immense joy to all her children, a joy that knows the far-reaching resonance of the sentiment that is typical of popular piety, even though it cannot be reduced to it. It is, so to speak, a theological joy, firmly rooted in the paschal mystery. In this sense, the Virgin is “causa nostrae laetitiae — the cause of our joy”. Catholics believe that after her Assumption into heaven Mary was crowned as Queen of heaven and earth. What kind of queen is she? How does she manifest the kingdom of God in her reign? As we remember Mary, Queen of heaven, we also think of earthly kings and queens. So often we are caught up in and confused by their power, seeming successes and riches. Today we will consider how we view power and success. If God chooses the lowly to fulfill His plan, how then should we think of those who are far from the corridors of earthly power? Let us pray for the grace to value humility and obedience above fame and authority, and seek to imitate Mary’s lowliness of heart. Let us look for opportunities to serve those less fortunate than we are. Let us meditate on the virtues of Mary, our Queen. She was not proud or grand; she humbly and patiently received God’s word and surrendered her life to His plan, not her own. Let us ask God to grant us those same heavenly virtues that will allow Him to guide and direct our path in life. Holy Mary, Queen of heaven, pray for us.